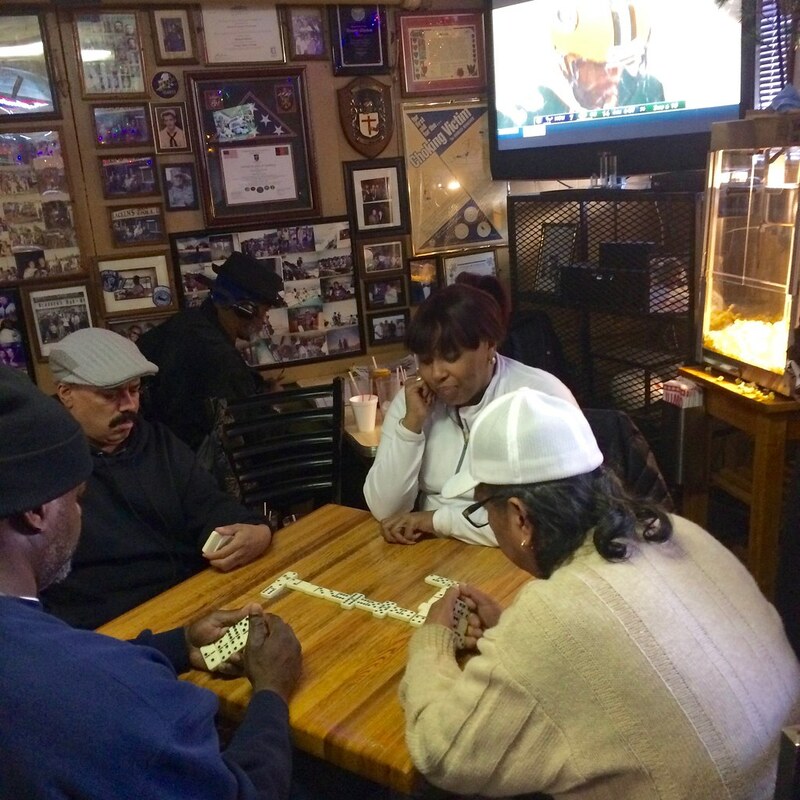 Yesterday the Tugboat Captain and I decided to pay a visit to Glacken’s, the estimable 76-year-old bar in the Bronx, where we watched plenty of football and dominoes (although not always in that order). 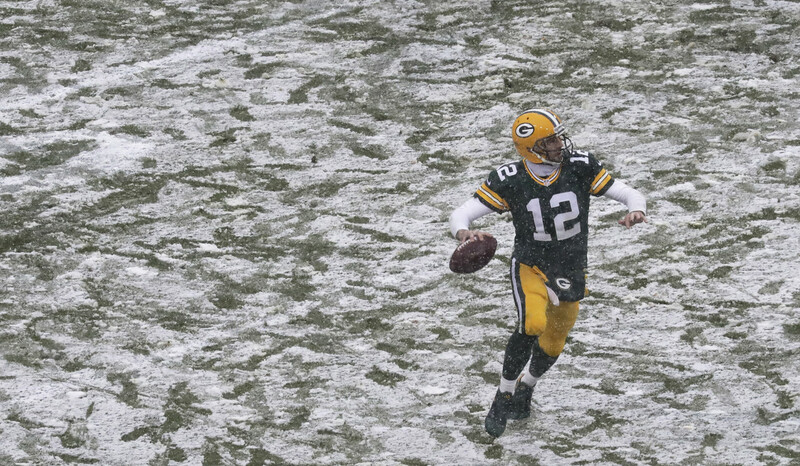 The football was particularly pleasing to the eye, because the game on the tube was the Packers/Texans tilt at Lambeau, where it was snowing — plenty of photos here — although the domino action was definitely more intense. Best bar in NYC, hands down, plus we spent nearly an hour yakking with some guy who gave us tips on where to eat in Memphis. A win-win-win! 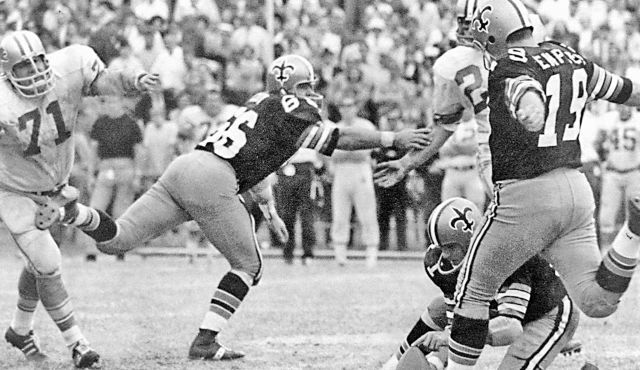 • The Saints wore 1960s throwbacks (additional photos here). Man do I love that shade of gold for the pants and numerals. I don’t even mind that the shade of gold on the helmets didn’t match, although it would’ve been nice if they had gone with the slightly larger fluer de lis that they used to wear back in the day. • The Bengals wore their orange alts. This was the first time since 2004 that they’ve worn the orange jerseys with black pants. Coach Marvin Lewis reportedly hates the look, but the players requested it. They’re 4-0 in that combo. • The Chiefs and Falcons played one of those mirror-image games — red over white vs. white over red (additional photos here). And the Cardinals and Washington did something similar. • The Jags went mono-black. • In case you haven’t seen it before, Seahawks defensive end Michael Bennett wear the world’s smallest shoulder pads.They’re basically kicker’s pads, and he says he wears them to make himself use good tackling technique. If he doesn’t do it right, it hurts. • Chiefs kicker Cairo Santos, who’s from Brazil, wore pregame shirt in in memory of the Brazilian soccer team that was recently victimized by a plane crash. 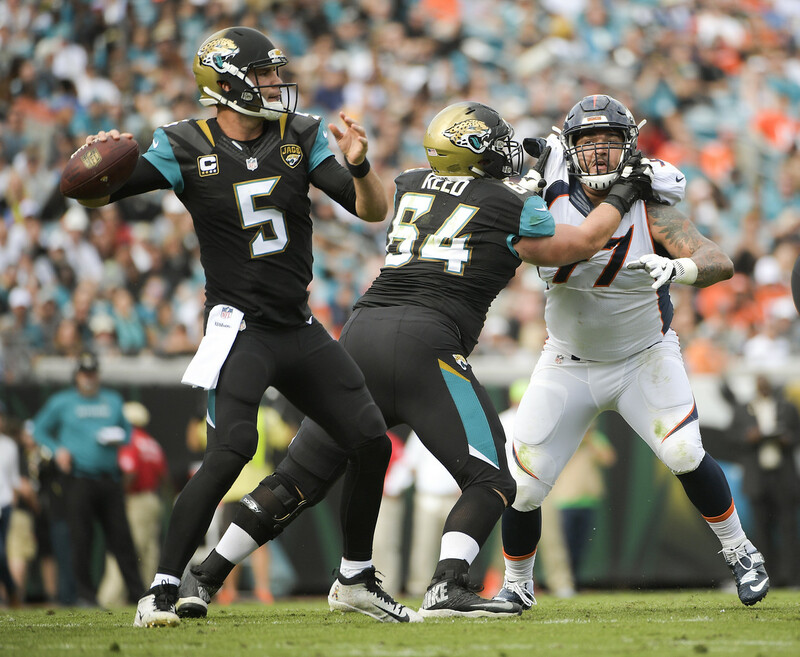 • Panthers quarterback and reigning league MVP was held out of the game-opening series for violating the team’s dress code. And what was that violation, you ask? He didn’t wear a necktie when arriving at the stadium. Yup. • Nobody wore white at home yesterday. • Players participating in postgame jersey exchanges included Antonio Brown (Steelers) and Odell Beckham Jr. (Giants); Nickell Robey-Coleman (Bills) and Malcolm Smith (Raiders); Zach Brown (Bills) and Kelechi Osemele (Raiders); Justin Hunter (Bills) and Mychal Rivera (Raiders); Mark Ingram (Saints) and Golden Tate (Lions); and several Eagles and Bengals players. • Here’s a gallery showing lots of yesterday’s custom do-gooder cleats in action. I noticed that some of them didn’t make it onto the field, though. Packers quarterback Aaron Rodgers, for example, had a striking green and gold pair but just wore basic black yesterday. Steelers quarterback Ben Roethlisberger was another player who was supposedly going to wear something eye-catching but instead went with his usual look. Hmmmm. • In a related item: Although the Titans and Browns had a bye yesterday, a Titans spokesperson had told me that a bunch of their players would be wearing the custom cleats this coming Sunday. 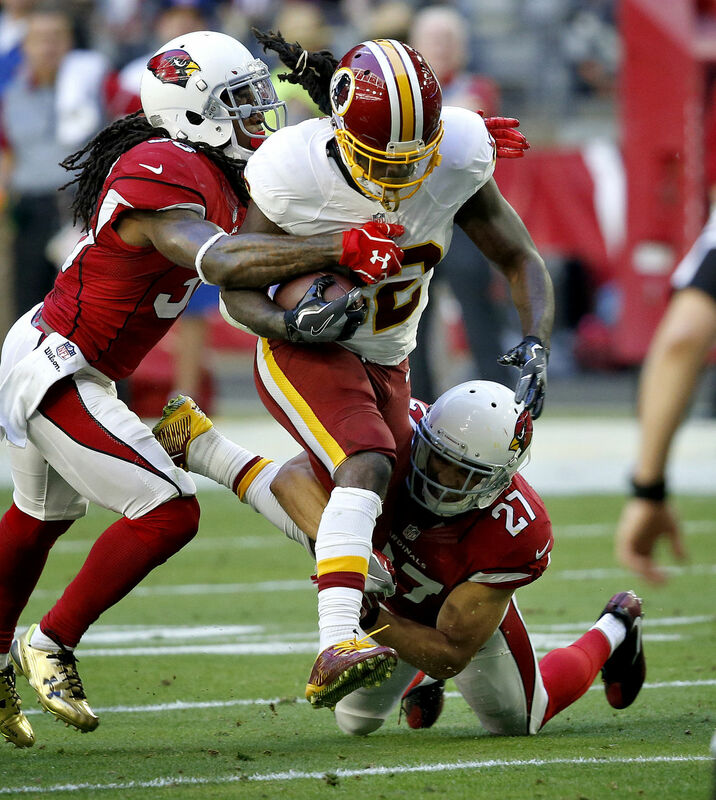 But now there’s a report that those two teams won’t wear the cleats this Sunday after all. Hard to understand the thinking behind that. • And one more cleat note: Eagles receiver Dorial Green-Beckham apparently pretended that Kanye West has a charitable foundation so he could wear Yeezy cleats. CFB Playoff unis released, sort of: For the third straight season, all four of the College Football Playoff teams are Nike-outfitted. And so the world is once again engaging in the odd ritual in which everyone makes a fuss over Nike “unveiling” the “new” uniforms for the four teams — which aren’t really new and don’t even make sense because two of the teams will be wearing white, so why show us their colored jerseys? (Wait, let me guess.) One of those teams is Ohio State. Everyone’s saying, “Oooh, ahhh, it’s the same jersey with the black TV numbers that they wore against Michigan.” Yes, but they can’t wear it in the first playoff round against Clemson because they’re going to be the visiting team and will therefore be wearing white. Word I’m hearing is that they’ll be going with this design, which they wore in the 2015 Sugar Bowl. For those who like to keep track of such things, Alabama, Ohio State, and Clemson will be wearing the new Nike template with the embarrassing name that I can’t bring myself to spell out, while Washington will be wearing the old Nike template with the other embarrassing name that I can’t bring myself to spell out. Finally, speaking of Ohio State, here’s a non-uni-related footnote: The Tugboat Captain’s new roommate is a high school English teacher here in Brooklyn, and she taught OSU running back Curtis Samuel. Says he’s a nice young man. The only new element is the baseball cap (which didn’t appear on our baseball-themed shirt because the player was wearing a batting helmet). It’s comes in four color options — our usual grey, black, green, plus a new “military green” (that’s what the manufacturer calls it, although I’d just call it light olive) — and is also available with either short or long sleeves. If you’ve ordered all five of this year’s previous shirts and also get this one, you’ll be eligible for our year-end “Collect ’Em All” prize, which will be a patch based on the jock tag design used on this year’s shirts. To qualify, please send me proof that you’ve bought all six shirts. The proof can either be (a) a photo showing all the shirts or (b) screen shots of the “Thank you for your order” emails you received from Teespring and Represent. Once again, the new shirt can be ordered here. Thanks for your consideration. NFL News: Bears RB Jordan Howard has been wearing the same T-shirt under his pads for every game he’s played in since the seventh grade. The shirt honors his father, who died when Howard was 12 years old (from Mike Chamernik). College Football News: Oklahoma’s social media team had an Auburn helmet with a white face mask in its Sugar Bowl graphic yesterday (from Brady Vardeman). … The Sun Bowl had outdated Stanford and North Carolina helmets at its press conference yesterday (from James Gilbert). 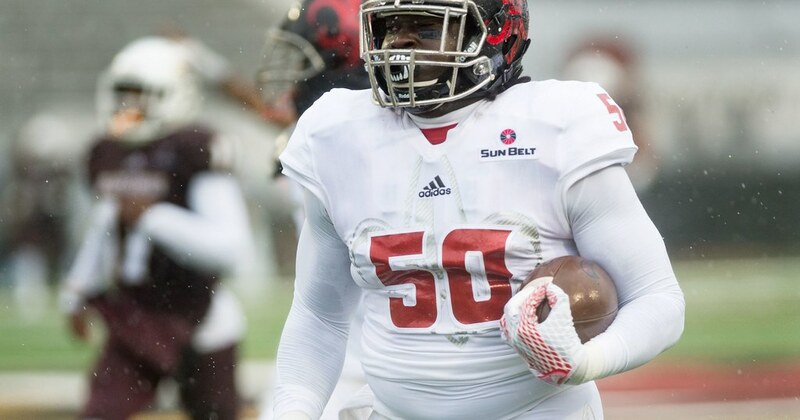 … The white jerseys Louisiana Lafayette wore on Saturday had a sublimated fleur de lis (from Tom M.). … Check out this awesome game program from the 1962 Army/Pitt football game (from EJ Borghetti). 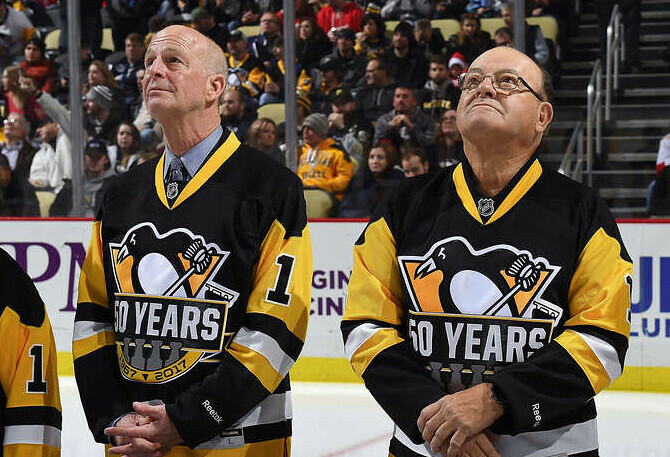 Hockey News: The Penguins honored the 1991-92 championship team Saturday, and outfitted former players with sweaters featuring the 50th Anniversary logo. (from Rob Ullman). … The University of Regina is getting innovative with uni numbers on the knees ”” and some slick yellow unis to boot (from Wade Heidt). College Hoops News: Creighton has worn two different white jerseys this season (from Padsker). … North Carolina gave away this Roy Williams bobblehead at its game yesterday (from James Gilbert). … Oklahoma State and Maryland played a gray/black game on Saturday (from Matt Shevin). Grab Bag: This Chicago Cubs World Series commemorative bat doesn’t include Wrigley Field’s new video boards (from Jack). … Whoops. Penn State wrestling had a few errors on its ticket to its match against Lehigh: The ticket calls the match a football game, and says it takes place in Beaver Stadium. (from Chris Flinn). YES. As a current Memphian, I cosign this recommendation. Best fried chicken, hands down. Best fried chicken in the entire world. Paul, you should come visit. What recommendations did you get? I’ve been to Memphis many times and actually have my own favorite spots. Gus’s for chicken, Cozy Corner for bbq, my friend Curtis’s house for drinking. But additional tips are always welcome. Good choice in Cozy Corner. Along with Gus’, I would say a Dyer’s deep fried burger ought to be on the planner. Also, can do your own BBQ taste off between Central, Germantown Commissary, and Rendezvous for three. Maybe a trip to Top’s and Leonard’s if you have time. Also, if you like dive sort of bars, the Windjammer might fit that bill. Maybe you can also get an audience with Prince Mongo. That’ll make your whole trip right there. Was in Memphis a couple of years ago for work and they provided Gus’ chicken. Absolutely amazing. Ezell’s in Seattle is the closest I can get for good fried chicken. Nothing here in Vancouver, that’s for sure. I had Ezell’s tonight for dinner. I’m a lucky man. Bengals wore the orange jersey/black pants combo for the first time since 2004. The players requested it. Marvin Lewis hates the look. Bengals now 4-0 in that combo. Thanks. I’ll add that to the text. I think its a great look for the Bengals. Probably my favorite. Good technique is safe technique. The league should shrink the shoulder pads for all the players so they no longer feel like armored projectiles when tackling. I always thought the bigger pads were there for the person being tackled. I’d much rather have the force spread out through a wider plate. I think Bennett’s torpedo like shoulders would sting a lot more. With the tiny shoulder pads I would bet he’s tackling more with his chest and arms (proper tackling) than his shoulders. I’d rather get wrapped up and taken to the ground than have someone launch into me. I thought I was taught the proper form. Wrap them up with your shoulder in their gut (or side). We were always taught to tackle by aiming our face mask (not the crown) at the center of their body and wrap up with our chest and arms. Emphasizing the ‘heads up’ method means you are spreading the force across the tackler’s entire upper body instead of concentrating the force into a single point (shoulder or helmet). And I think that’s what Bennett is getting at. By wearing smaller pads he’s more likely to tackle with his entire body instead of launching at the ball carrier with his shoulders. He’s a little high here, but you can see that he’s making contact with his entire chest/torso here and wrapping up. I did Google search for “tackeled by Michael Bennett”, and he is demonstrating pretty solid form in almost all the images. Seahawks have also been leading in bringing the rugby-style tackling to the NFL and college in taking the head out of the action. The Seahawks put out a video a couple years ago that has been used by programs around the nation. This is fantastic. I’ve long said that the trend to body armor was killing fundamentals, nice to hear a player say it. I’ve often wondered how the injury rate would fare in football if kids didn’t play with helmets starting at a young age all the way on up. Obviously rugby still has its share of head injuries, but I feel like, in the NFL, you’re way more apt to see a defender launch himself at the ball-carrier, often going for a knock-out blow. As stated above, rugby utilizes a more fundamentally-sound technique–does anyone know if the sort of knockout blows we *love* seeing in football are illegal in rugby? It’s always intriguing to me when people use appropriate words that, at first, don’t quite seem correct. Just an observation form within my own brain. Is victimized the right word? I think victimization requires the presence of someone acting with malice or ill intent toward the victim, which we usually don’t associate with a plane crash. Unless we saying the airline operators acted with ill intent (a case that may not be difficult to make in this situation). Its an interesting construction. According to MW it can be either “to make a victim of” or “to subject to deception or fraud.” The reason it sounds wrong in our brain is because it anthropomorphizes the plane crash and makes it the active cause of the death of the players. Which is surprising, because Paul has, in the past, noted the the use of the passive voice and similar euphemisms as problematic, and yet here he seems to do the same thing. I don’t actually recall having said anything about the passive voice (if you can point me to where I’ve done so, please do), but I agree that this was sloppy writing on my part. Knee numerals is a case of adding one-too-many elements to an otherwise wonderful uniform. Appear to be based on the old Chicago Cougars’ kits. Me likely, but yes, I could do without the numbers on the knee (or would they be knumbers?). Yes!! A takeoff on those wonderful WHA Chicago Cougars unis. The knumbers…. eh. Aaron Rodgers wore his custom cleats during warmups, then switched to another pair for the game, per Packers PR man Jason Wahlers in a tweet to ESPN’s Rob Demovsky. 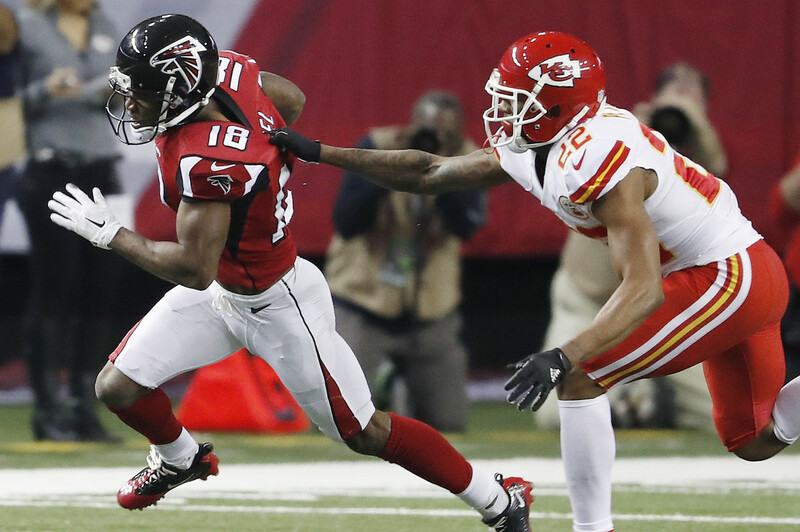 * The Chiefs and Falcons played one of those mirror-image games – red over white vs. white over red (additional photos similar. 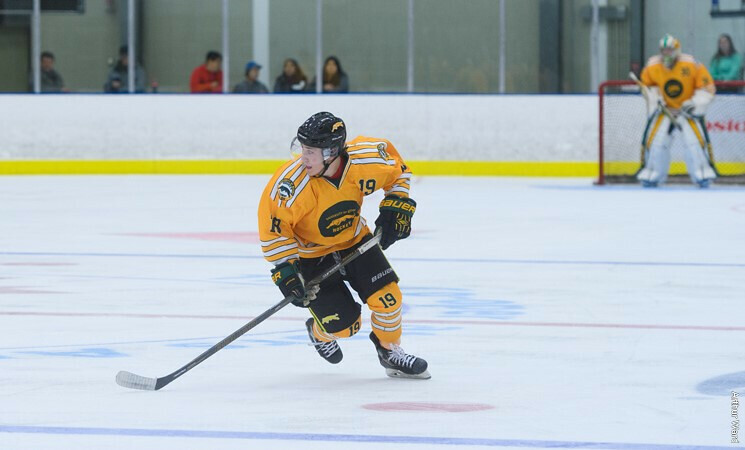 * The University of Regina has introduced is getting innovative with uni numbers on the knees – and some slick yellow unis to boot (from Wade Heidt). Regarding those University of Regina unis, it looks like they modeled them after the Chicago Cougars of the WHA. – The U. of Regina hockey team is the Cougars as well. Colours are the same, except Regina includes some black trim. – The logo with the green background on this uniform is handled similarly to how the Chicago Cougars displayed their logo. I also thought of the WHA Chicago Cougars. Classics, but under-rated. Glad to see that those unis aren’t forgotten. If you really want your minds blown, all of the UofRegina teams are the Cougars except the football team who are the Regina Rams. I’m not sure there are any other schools out there that have a single team named differently than the rest at the school. McGill University! Martlets for women’s sports and Redmen for men’s sports, except just the baseball team is the Redbirds. The Saints did use the throwback fleur de lis (with the single white outline) yesterday; I sippose the had to make it a bit smaller than the original to fit on current helmet shells. That is “I suppose they” above. I hate typing on a phone. While it may look stupid when you actually see it live, those photos of U of Regina numbers on the knees look quite cool. Note the uniform is actually very similar to the uniform in the 1970’s worn by the WHA’s Chicago Cougars, although I don’t think the WHA team had the numbers on their knees. That right, the WHA Cougars did not have knee numbers, but they did have the front jersey numbers that you can also see on the Regina player. I agree that they are very cool! During the Raiders-Bills game the announcers mentioned that the field had poor footing in some places, and then the camera showed some of the spots. They wondered if any players would change out of their custom cleats into some that would afford better footing. As I far I could tell nobody did, but there were guys falling without being touched. Poor footing may be why Rodgers and Roethlisberger ended up not wearing their custom cleats. Aren’t the spikes interchangeable on almost all their cleats? In the picture of Rogers’ custom cleats you can see the little triangles on the spikes that the cleat wrench would grab onto. The custom cleats seem to be the same model as Rodgers’ standard cleats. Sorry, don’t know how I screwed up that second link – these are his regular cleats this season. Seems to be the same model? Roy Williams bobble looks like Jim Tressel. Somebody needs to get Michael Bennett a properly fitting jersey, because that just looks ridiculous. Cam’s replacement for that series threw an interception that directly translated to a score. Do you know of any other examples of a self-imposed team conduct suspension that had such a direct negative result? On my high school soccer team a few starters were late for practice and the coach imposed a symbolic penalty of not starting them (so they weren’t introduced) but lined them all up as subs for the first stoppage, which turned out to be after we gave up a goal almost immediately. The interception was hardly Derek Anderson’s fault and Newton’s benching didn’t lead to the score in any way. 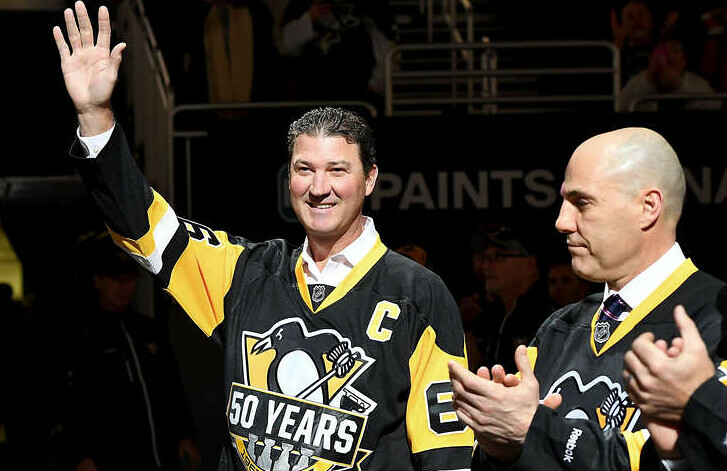 To answer your substantive question – I can think of lots of NHL examples. I think it happens more in hockey because the team roster is bigger than the game roster so you can sit a player without going short-handed. Google “healthy scratch” for endless examples. This comment should be removed until proven. With all the fake news being shared I don’t think slandering Newton is fair and certainly uniwatch is above that. I live in Charlotte, talk Panthers with a good number of people, listen to local sports radio and FWIW have not heard anybody speculate that Cam did anything worse than not wear a necktie. 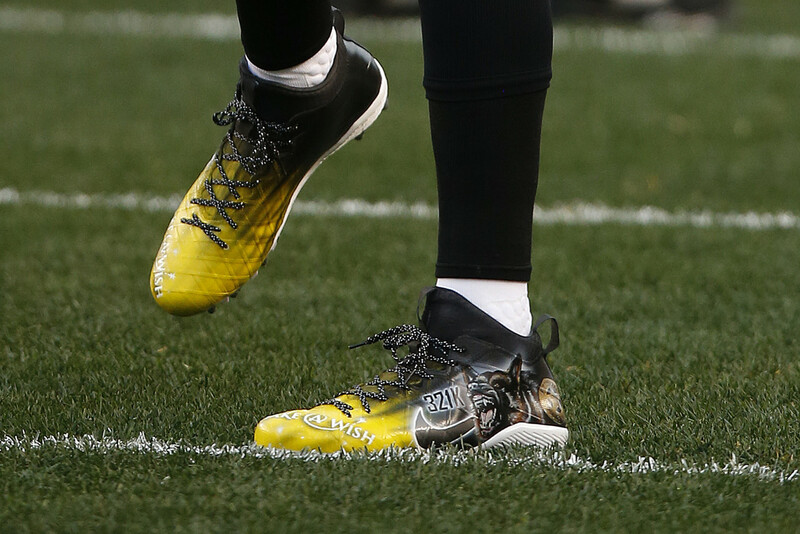 Roethlisberger did wear custom cleats, just not the ones originally unveiled. 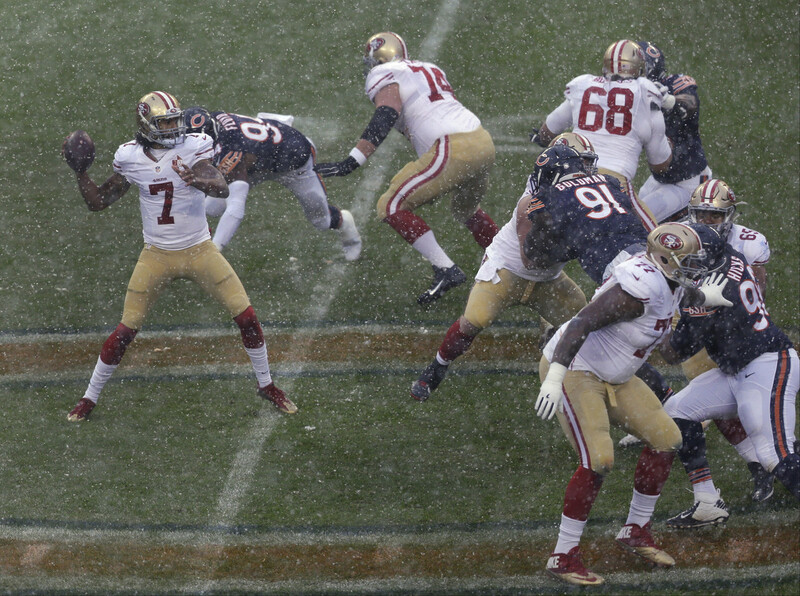 They’re hard to make out in that Getty photo, but NFL.com has close-up shot. Sorry, here’s the shot itself. I wish NOT to be mauled by the dog depicted on his cleats. His cleats represent his foundation (The Ben Roethlisbeger Foundation. It benefits two main causes…Make A Wish and supporting police departments’ K-9 units throughout the US. 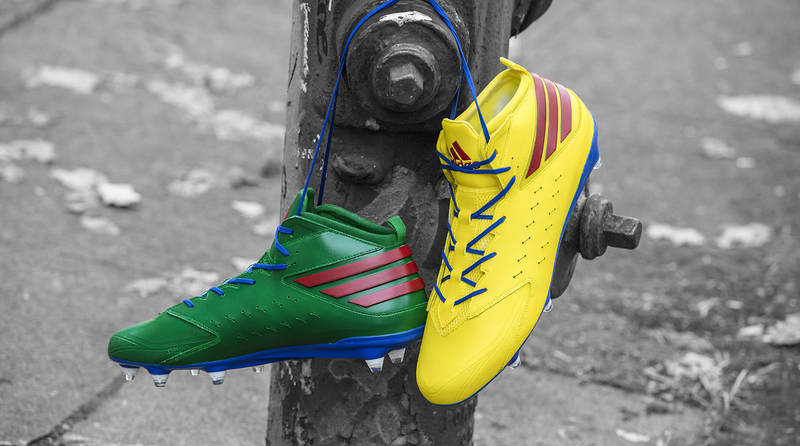 Both his original custom cleats and the ones he actually wore were in support of the same charity. What’s interesting to me is that he switched from one design to another, from a gaudy red/blue job to one that was mistaken for his standard look. Perhaps that was his intent. Let the artist get creative on one and draw attention to the fact that he wore special cleats, but switch to something more aligned with the uniform for the game. Maybe he Gets It? Saints did look good yesterday (well, at least their togs looked good), although I’m partial to the white pants. Unfortunately, when they brought out a number of former players to honor them, they clothed them in the current Nike jersey with the collar. Blech. 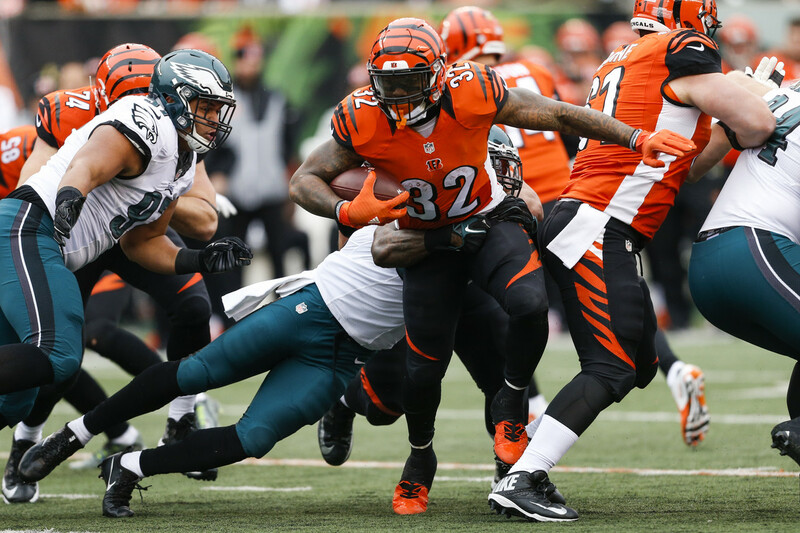 The photo from the Philly/Cincy game best shows the gunmetal-colored stripes on the Eagles pants. It could be my color-blindness, but I always have trouble seeing those. Didn’t people say they were seeing a pink afterimage on their uniforms earlier this year? The Eagles shade of grey is a pigment-free version of their “Midnight Green”, and pink is the complement of that shade of green. Paul, not sure if you already knew this but Terry Proctor passed away. RIP. 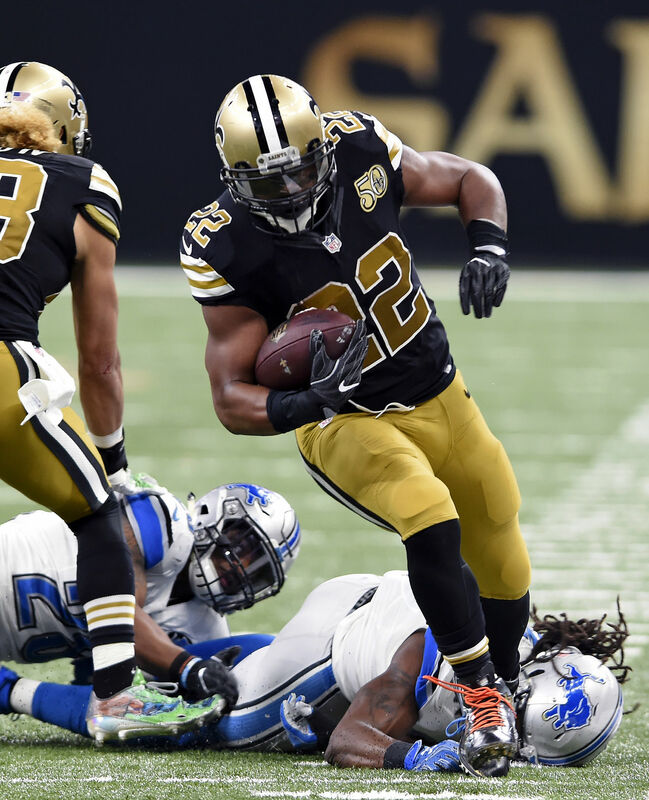 Am I the only one that’s bothered that the saints didn’t wear grey facemasks for their throwbacks? It’s more like a 1994 75th anniversary throwback than a 1960s throwback. Amirite? Does it annoy anyone that the arrow and the KC on the Chiefs’ helmet is outlined in black, rather than yellow? Or gold, if you prefer calling it gold. Nah. Off the top of my head, I can cite Washington’s, San Francisco’s, Pittsburgh’s, and Tennessee’s helmet insignias having colors outside the official palette. Not enough dissonance to offend my eyeballs. It bugged me a little that they didn’t have any yellow in their logo nor black on their uniforms. What bugged me more were their pennants in the 60s and 70s. To save money they only printed two colors – red and black – on yellow felt. Since it wasn’t on the decal they could’ve printed red and black on white, or even red and white on black. Also, piss-poor job on the forehead. I like the gold on the Saints pants, too. But is it the same as the Jaguars? I’d love to see the Saints or Bags go with a gold jersey, although no more gold color rash. Saw a Bills tailgate video last week. One fan had a color rash jersey. By itself, it’s not a bad look. Jacksonville may be having a bad season, but I’m not sure their personalities mean they are Bags. Hi Paul. Re the latest T, what’s the difference between the Next Level Fitted Premium choice and Gildan Short sleeve? The dimensions of the size I would order are identical it seems, as is the fabric combo (90/10). Thanks. Next Level is the default offering that Represent usually offers. We added Gildan because they go up to 5XL. Despite common sense and PL’s previous report that the Browns and Titans would have this weekend to wear their customized charity cleats, apparently not! Although it’s padded, Ryan Fitzpatrick wears a chinstrap with only two tabs. Weird mish-mash here — a company in Kurdistan called “Trump Fish” just opened, with the Chargers logo as the hair. To be totally clear, the white UNC helmet in the Sun Bowl photo was not an “outdated” one, but a design that the Heels have never worn (with no center helmet). It’s almost as though somebody at the Bowl couldn’t get a real helmet and had to improvise.